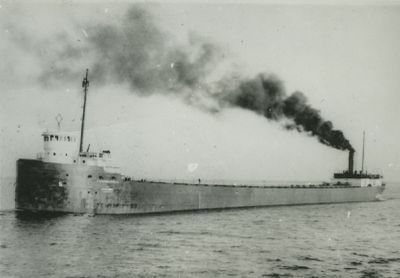 1913-1966 Owned Interlake Steamship Co., Cleveland, OH. 1917 Renamed MCCULLOUGH, C.H., JR.
1917, May 10 Stranded Corbeil Point, ONT; lightened & taken to Toledo, OH for repairs. 1966-1970 Owned Pickands Mather & Co., Cleveland, OH. 1969, Aug Re-registered as barge. 1970-1980 Owned Cement Transit Co.,(Medusa Portland Cement Co.), Detroit, MI. 1980 Sold to Western Metals, Thunder Bay, ONT for scrapping.